I posted about this illegal billboard on illegalbillboards.org a few days ago and Rami Tabello from illegalsigns.ca, being the most versed person I know on Illegal billboards, picked it up and gave it some interesting back story. This sign is not only illegal for not complying with its permit but in fact it was removed by the DOB because of its illegality approximately 3 months ago. The fact that it has been rehung is proof of the blatant disregard outdoor advertising companies have towards the laws of NYC and towards the interests of its citizens. We’ve written quite a bit about fascia signs on mural permits. In fact, the City of Toronto is now being sued by Titan Outdoor over the issue. Toronto is not the only city with a vinyl sign on a painted sign problem. There is a lot in common between New York City and Toronto. Billboards for one. Billboards are permitted, with restrictions, in the parts of downtown that are zoned for manufacturing. They are banned in historic districts, though painted advertisements are allowed on some buildings. And within 100 feet of a residential zone or park, billboards are allowed only if they face at least 165 degrees away. So the NYC code has more permissive regulations for painted advertising. 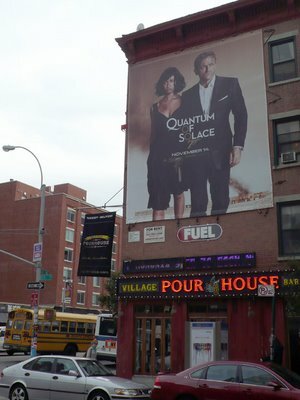 The photograph above, from IllegalBillboards.org, is of Fuel Outdoor’s illegal billboards at 64 3rd Avenue. A complaint was filed against the sign on August 14, 2006. Then in December 2007, Fuel Outdoor obtained a permit to paint a sign on this wall. 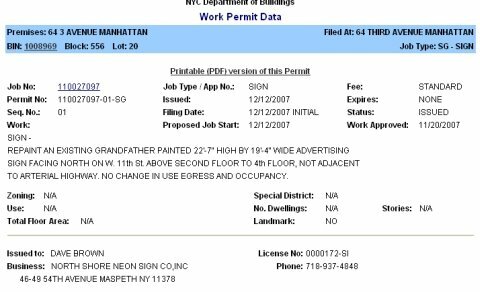 The permit appears to specify that there was an existing legal non-conforming painted sign on this wall. We would doubt that. We’ve written about Fuel Outdoor before in Fuel Outdoor - The Dirtiest Billboard Company in America and Fuel Outdoor Builds 324 Illegal Signs in New York City Then Sues New York City.